Arrow doesn’t have a stellar track record when it comes to villains. There have been high points, for sure—Manu Bennett’s Slade Wilson remains compelling, Neal McDonough’s Damien Darhk had some issues but was often great fun, and even when Malcolm Merlyn didn’t make a ton of sense, John Barrowman was always at least a little bit entertaining—but there have also been some duds. The Arrow baddies often land somewhere between forgettable (any number of oddly named criminals who are currently cuddled in a corner of Star City’s penitentiary) and cringeworthy (hey, Cupid.) Not so this season, and it’s not only because Katie Cassidy is clearly having a much better time sinking her teeth into Black Siren than she ever did playing Laurel. No, it’s because Michael Emerson is on this show now. Michael freaking Emerson. This is not a drill. Having a well-known actor with a knack for playing oddballs arrive in a superhero show isn’t automatically a cause for celebration. So much still depends on writing, and on the shape of the season. It’s far too early call Michael Emerson’s Cayden James an all-time great Arrowverse villain. He’s got something in the area of 10 minutes of total screen time here. Still, his arrival brings with it a burst of new energy. The previously unseen Cayden James used to be a vague, dubious genius with plans that only made sense if you squinted. Now, he’s a soft-spoken and malevolent mastermind with some kind of dastardly long game and a knack for anticipating how intelligent people will react. What those plans are is unclear, but one thing’s certain: he’s not an unstable emotional whirlwind. With Emerson on board, we’ve got an Arrow villain whose intelligence fairly crackles, who isn’t playing evil but is instead just following the script he wrote, making things happen. He’s not chaotic. He’s quiet, focused, and controlled. That’s a huge departure from last season’s primary villain. More importantly, it’s a stark contrast to the state of Team Arrow and its Arrow Emeritus. In “Reversal,” Oliver finds himself in Felicity’s shoes. He stays behind with presumably very expensive fancy meals as she rushes out of restaurants, he asks for information and gets only enough information to be worried, he tries to help (albeit ineffectively) and is told to let her handle it alone, he swoops in at the last minute to save the day just when the hero is most in need, and does so from a chair in the bunker. He’s the new Overwatch, pretty much, and while I’d personally watch the hell out of a series in which Dig remains the Green Arrow and Oliver fills in as Overwatch when Felicity needs to be on site or is busy with her newly named startup, it doesn’t seem likely. Still, as part of the titular reversal, it’s entertaining enough, and gives Stephen Amell a chance to do something he does increasingly well: play a guy who’s trying really hard to be good at talking about his feelings in a relatively healthy manner. 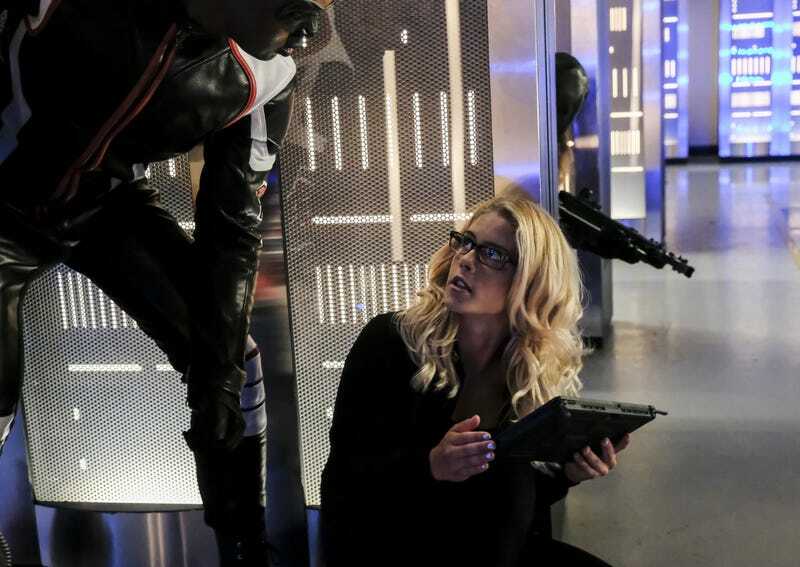 The other half of that reversal sits at the episode’s center, and it gives Emily Bett Rickards a chance to stretch a little for the first time in this young season. Watching Felicity attempt to navigate the wells of guilt, anger, and self-reproach that are usually home to Oliver is interesting, and certainly a better use of Rickard’s time than quirkily pining. Both she and Amell manage to layer in some wry amusement, as though Oliver and Felicity recognize the irony and can’t help but be tickled by it, inconvenient though it may be. That lightness manages to keep a story that might otherwise feel doom-laden in a very mid-season Arrow kind of way from descending into the muck. Yeah, it’s heavy, and there are casually broken necks, lots of bloody ears, and fights in dark rooms with unnecessary electrical sparks. Yet it dodges dour entirely, thanks largely to Amell, Rickards, and a script from Sarah Tarkoff and Emilio Ortega Aldrich. Of course, some of that’s due to the heavy stuff that’s just ignored (or, to be more positive, tabled for later) in “Reversal.” Gone is any suggestion that Dig’s not coping with his injury in a healthy manner, and so is any tension between he and Dinah. There’s no sign of Sydelle Noel’s Samanda Watson, nor of William and his troubles. Quentin’s never seen, so no worries about how he’s handling the fact that his not-daughter is killing people in remote locations all over the city. And the anti-vigilante referendum seems primed to fail, so Oliver doesn’t have to spend much time worrying about being mayor. It’s just the Oliver and Felicity show, which seems like it might be a cute little story with just a few Black Siren interruptions until Alena (the great and still underused Kacey Rohl) turns up. Please don’t take this as an argument that Arrow needs to go darker. It really, really doesn’t. But it does seem that this series strikes the best balance when it infuses the characters with a sense of humor about the darkness of their lives—thanks, Wild Dog (and Rick Gonzalez) for the reliable punchlines—but doesn’t ignore that darkness entirely. And so we return to Michael Emerson, himself a master of making sure there’s room for comedy in even the blackest and most messed-up situations. I’d never call his role on Lost a comedic tour-de-force, but he was a pro at finding ways to bypass dark in favor of darkly funny, even for just a tiny moment. That’s not the case here—he’s eerily cool and unhurried, in contrast to the chaos that surrounds not-Laurel and Team Arrow—but his involvement does seem to promise something smart and strange on the horizon. Let’s hope that’s the case, and that in its sixth season, Arrow finds a way to inject some oddball complexity into the darkest corner of the Arrowverse. I know Arrow likes to play with fan service, but Curtis as a ‘shipper? Nah. Pass. I missed his name, but Cayden’s henchman has primo creep-from-the-’90s face. A knifeblock in the foreground has never meant anything good. It’s such a little thing, but I love that after Curtis takes off his Mr. Terrific makeup, he’s still got a little bit of a smoky eye. I meant to write down a few more quotes this week—the episode was so quippy!—but Michael Emerson showed up and I just wrote “MICHAEL EMERSON” and stopped taking notes.